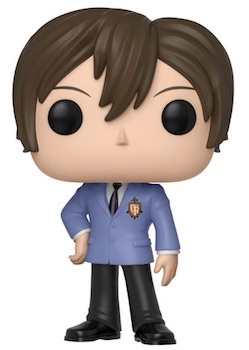 There is no need to enroll at Ouran High as the students from the wealthy school come to you in Funko Pop Ouran High School Host Club! 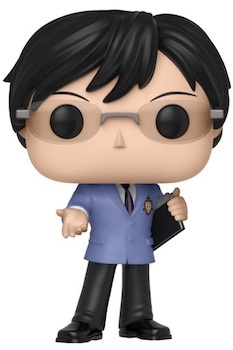 As the primary character, the brown-haired Haruhi Fujioka headlines the vinyl set. One of the less affluent students, she is a natural host, dressed in her official blazer with black pants, shoes and tie. Ranking members of the Host Club, and co-founders of the club, the cool Kyoya Ootori and princely Tamaki Suoh both come in a similar ensemble. Making the figures easy to distinguish, the blonde Tamaki extends a rose while the black-haired Kyoya wears glasses. Kyoya also reaches out with one empty hand, holding a book in the other. Order Funko Ouran High School Figures on Entertainment Earth. Originally a manga series, Ouran High School Host Club was later released as an anime series, as well as in many other forms, with worldwide interest. The Pop! set was first revealed at the 2018 London Toy Fair. 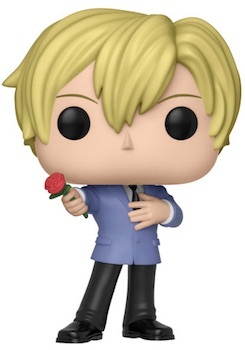 Check back for additional details regarding Funko Pop Ouran High School Host Club as they are announced. Ouran High School Host Club - Kyoya Pop! Vinyl - FunKo Free Shipping! Pre-Order Ouran High School Pop Figures on Entertainment Earth.